If you read this blog regularly, you're a liar, because I don't regularly update. It's been awhile since I've posted a craft, but it's also been awhile since I've crafted. To be honest, I think crafting should be done out of necessity rather than hobby. Also, I believe that crafting should provide a useful outcome that is cheaper than manufactured goods. Christmas was this past week, and I say good riddance to the season of merry-making and cookie-binging. Christmas is costly, I decided to cut fiscal corners this year in providing gifts to extended family. There comes a time in life when it's no longer okay to come empty handed to a holiday party, especially when you're related to most of the guests. Candles are a cost-efficient way to impress people with your handiness, if I had more practical skills I'd probably make something better than candles. Frequenters will remember the black licorice candle I made a few years back. That one didn't really turn out very great because I didn't use enough essential oil. With that in mind, I made these with the same amount of wax but used twice as much oil. I like my candles like my men, strong and stinky. I chose this scent combo because I had one last year that I loved. 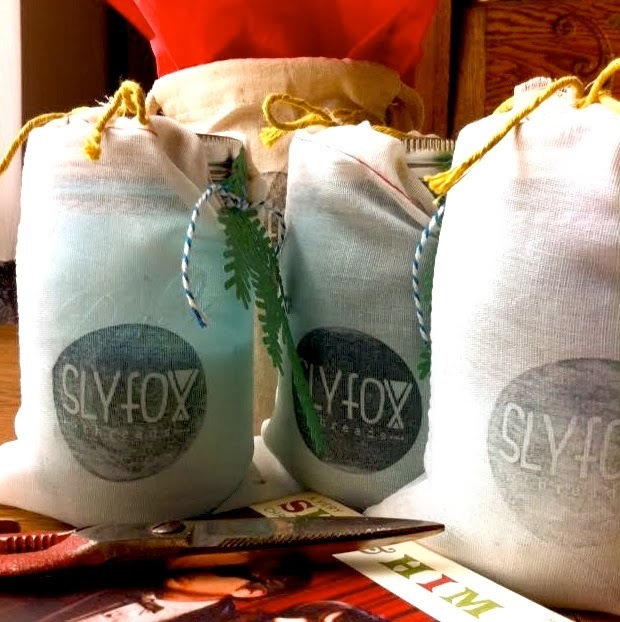 The piney-minty scent is festive but not too festive and it helps your sinuses clear up during the sniffly season. Kinda smells like a retirement home. STEP 1: Chop candle wax into coarse pieces and place in disposable mixing bowl. Put that bowl in a large pot of water. Double boil the wax and allow to melt. Stir frequently with disposable rubber spatula. Don't let the wax boil as it is flammable. Keep an eye on the temperature with your candy thermometer. The idea temperature is between 120 and 140 once the wax is liquid. STEP 2: Dip the wick bases in melted wax and adhere to the bottom of jars. Pinch the tips with clothespins so the wicks stay in place. STEP 3: Once wax is at desired temperature, mix in essential oil and thoroughly distribute. Transfer wax from bowl to disposable pitcher. 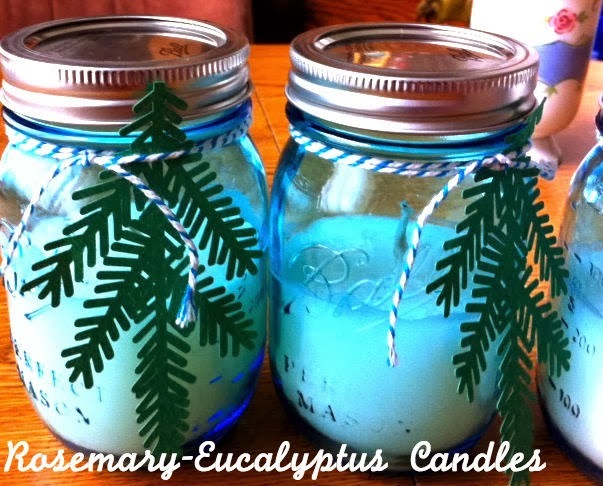 Pour hot wax into jars reserving one cup to fill in where candles sink. Allow to cure overnight. It is normal for the wax to drop in the center once it cools. This is why you'll need the extra cup of wax. STEP 4: Reheat cup of wax by placing the picture in a pot of boiling water for a few minutes. Pour melted wax into caverns formed by the candle cure. Allow another 24 hours to cure completely. 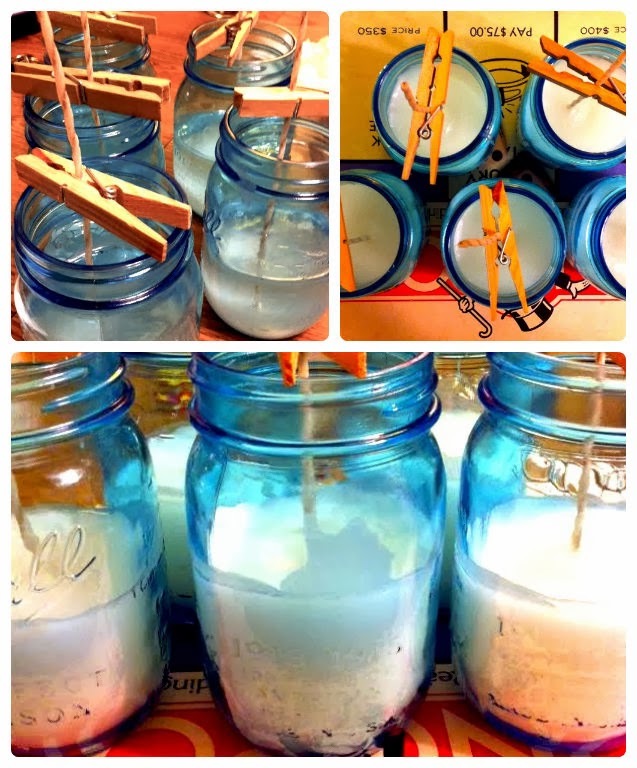 Once cooled, trim wick down to 1/4 inch before lighting. I used random supplies I had in my craft box to trim and decorate. People loved these and they smell amazing. Happy Holidays!